Every year, more of our open water students prefer the online class. PADI's interactive eLeraning website gives you the background information about skills, terminology, and safety procedures that you need before you dive. It includes unlimited access to PADI's OW Instruction Manual. eLearning will ensure you master the knowledge required to complete your dive training. Passing scores are required, but you can count on PADI's website to give you the tools you need, while making it enjoyable at the same time. The all-inclusive cost for the PADI Open Water Certification is $549. Register at Discovery World and we'll sign you up and provide you the PADI eLearning Link. 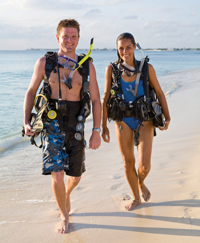 The fee is all-inclusive and covers gear rental, all your pool training and open water dives, certification card and all the required forms and materials for the course. 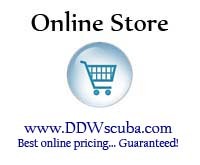 Divers are responsible for their personal gear (mask fins, snorkel) available at DDW (with a 10% student discount!) You have the option to sign up now at padi.com, then call or visit us to schedule the diving portion of the class. Another option to complete the coursework is through our dive shop classroom. We recommend that you come to the dive shop at least a few days in advance of the course to purchase the additional study materials, which include a required 4-hour instructional DVD set and the 5-chapter dive manual. You will be required to watch the DVDs and review the manual before the classroom start date. Cost for this option is $449. Discount for military (active or retired) and their dependents is $25 off the regular pricing. Discovery Dive World also extends this discount to anyone (non-military) who has a family member enrolled in the same open water dive course (both receive the discount). Open Water Referrals: Discovery Dive World is a Universal Referral Facility. Our highly trained instructor staff can complete your certification through our facility regardless of what certification agency got you started. Please remember to bring your signed referral document (valid for 12 months) and a copy of your medical statement. Click Here to download your required PADI course liability forms. START YOUR COURSE RIGHT NOW at PADI.com.